Home > Speakers > Amy Butler D.V.M., MS.
Dr. Amy Butler is a native of Ann Arbor, MI, and completed her undergraduate degree at Tufts University in 1995. She graduated with her DVM from Michigan State University in 2000, and then completed a rotating internship at the University of Minnesota in 2001. Dr. Butler spent several years working at private emergency hospitals in the Detroit area. She then completed a residency in Small Animal Emergency and Critical Care and a Masters of Science in Clinical Sciences at Colorado State University in 2007. 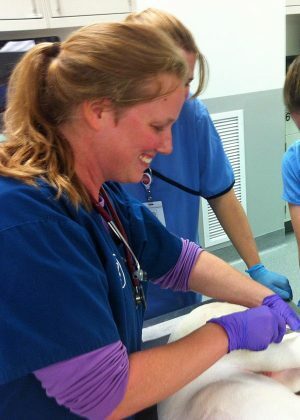 She became a Diplomate of the American College of Veterinary Emergency and Critical Care in 2008. Following residency, she joined the faculty of The Ohio State University as an Assistant Professor, where she co-managed the E/CC service until 2011. She then worked as the Director of Emergency and Critical Care at Veterinary Referral and Emergency Center, a busy multi-specialty referral hospital in Clarks Summit, PA. Dr. Butler is currently the President of Critical Consults, a telemedicine firm specializing in immediate consultation on emergency and critical care cases.